UPDATE 1130 GMT: Pro-Assad shelling of Idlib Province continues on Thursday, according to pro-opposition activists. In response, the rebel National Liberation Front is firing rockets on regime positions in the al-Ghab Plain in northern Hama Province. 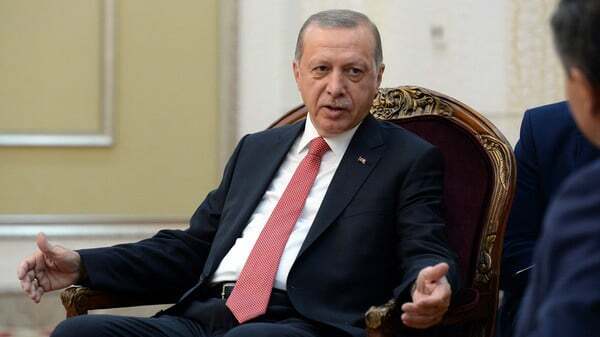 Turkish President Recep Tayyip Erdoğan has forcefully reiterated Ankara’s objections to a pro-Assad assault to recapture Idlib Province, the last major opposition area in Syria. Turkey hosts more than 3 million Syrian refugees and closed its borders in 2016. Will Erdoğan Hold Out v. Putin? The Turkish President meets Iranian and Russian counterparts Hassan Rouhani and Vladimir Putin in Tehran on Friday. Russia, backed by Iran, is pressing the Assad regime’s case for attacks on Idlib, western Aleppo, and northern Hama Provinces. However, Turkey has held out, including in two meetings between Foreign Minister Mevlüt Çavuşoğlu and Russian counterpart Sergei Lavrov last month. On Tuesday, Russian and regime warplanes bombed and shelled near Jisr al-Shughour in northwest Idlib Province, killing at least 13 civilians. More shelling was reported on Wednesday. The Trump Administration has modified its line on pro-Assad attacks to take a tougher position, at least in its rhetoric. On Tuesday, Administration officials — including UN Ambassador Nikki Haley and White House Press Secretary Sarah Huckabee Sanders — drew a line against chemical attacks but appeared to leave the door open for a conventional air and ground assault. The change followed a meeting between Secretary of State Mike Pompeo and Turkish Foreign Minister Mevlüt Çavuşoğlu, in which the two men agreed that “any Assad regime military offensive in Idlib would be an unacceptable, reckless escalation of the conflict”. 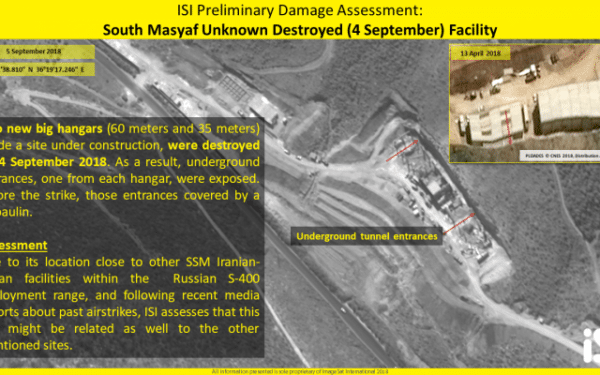 Photos have been posted of purported damage at an Assad regime military site, from a suspected Israeli airstrike on Tuesday. The rare daytime strike is said to have targeted Iranian assets between the town of Masyaf, where a large regime military complex is based, and Wadi al-Uyun. The photos showed two large hangars, 60 and 35 meters in length, destroyed in the attack. Due to its location close to other surface-to-surface missile Iranian-Syrian facilities within the Russian S-400 [air-defense system] deployment range, and following recent media reports about past airstrikes, ISI assesses that this site might be related as well to the other mentioned sites. Following standard practice, the Syrian military claimed air defenses successfully intercepted several missiles, without producing evidence to support the claim. Israel has periodically carried out airstrikes on pro-Assad facilities and personnel, initially to prevent transfer of Iranian weapons and missiles to Hezbollah and to deter the establishment of Iranian and Hezbollah forces in southwest Syria, near the Israeli-occupied Golan Heights. The strikes have intensified in the past year, as Prime Minister Benjamin Netanyahu has pledged to pursue the removal of all Iranian and Iranian-led personnel from Syria. It is time for the EU to give Erdogan support or suffer the consequences of yet more unwanted refugees. Trump will do nothing because his owner (Putin) has already told him to do nothing in their recent secret meeting (just what nationality where the translators present?). NATO should also make a serious commitment that if any county attacks Turkish troops, that are in Syria under an agreement with Russia and Syria, they will be obliged to respond. Great idea. So if Turkey decides to invade Israel, to liberate the Palestinians territoriies, NATO is obliged to respond if Israel attacks Turkish troops right ? The Acidic regime must have run out of hospitals to bomb already!